As a Fighter Command airfield, RAF Hawkinge played a major part in the Battle of Britain. No other major fighter base was as close to occupied Europe and it was used as a forward base, allowing aircraft to respond to Luftwaffe raids as soon as they approached southeast England. Sited between Folkestone and Dover, Hawkinge was very vulnerable to attack and its importance was recognised by the German planners of Operation Sealion – the invasion of the UK. Plans were made for paratroopers to seize the airbase as a priority so that aeroplanes from the Luftwaffe could land there on what would have been the shortest flight across the English Channel. Hawkinge played host to both Hurricanes and Spitfires but it is primarily associated with Sidney Camm's Hawker Hurricane. The first of these fighters from No 3 Squadron flew into Hawkinge on 17 December 1939. In February 1940, the command of the base was transferred to No 11 Group Fighter Command. Because of its geographical setting, Hawkinge was to play a major role in the Dunkirk evacuation. Both the hundreds of ships that crossed the Channel and the men queuing on the beaches of Dunkirk needed fighter cover. The Hurricanes based at Hawkinge were ideally placed to give this support. As a forward air base, many squadrons that would arrive at dawn, refuel and fly on to the coast of France used Hawkinge. 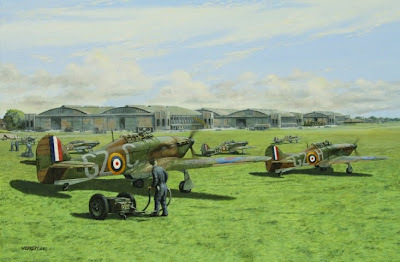 While the evacuation continued, these fighter planes would return to Hawkinge to refuel and rearm and return to action. Only when it started to become too dark to fly would they make a final return to Hawkinge to refuel and then return to their home base. The following day – while Operation Dynamo continued - the pilots would repeat the process. The role the ground crews played at Hawkinge in the success of the evacuation at Dunkirk cannot be understated. They kept the fighters flying and this aerial cover was vital to the success at Dunkirk. After Dunkirk, there was a real fear that Hitler would launch a concerted attempt to invade and conquer Britain. The southeast coast would literally be in the front line of any invasion. Hawkinge was quickly given far more protection from attack as a number of high-powered anti-aircraft guns were placed around the airfield’s perimeter. July 19th 1940 was one of the darker days in the history of Hawkinge. Using Hawkinge as a forward air base, Boulton Paul Defiants landed from their base in West Malling. Just after mid-morning they took off to confront what turned out to be Me-109s. Twelve Defiants were shot down in what became known as the "Slaughter of the Innocents". Hawkinge was bombed for the first time on August 12th 1940. Major damage was done to the base. Repeat raids were made on August 15th and 18th and September 1st. While the base was badly damaged, the grass runway was more easily repaired than the damaged buildings. Because Hawkinge was used as a forward air base, Hurricanes and Spitfires could continue to land and refuel/rearm without having too much of a concern about their final end-of-day destination – their home base. On September 7th the Luftwaffe, once again, attacked Hawkinge. The base headquarters took a direct hit but some bombs also hit the village killing six villagers. September 15th, viewed by many as ‘Battle of Britain Day’, saw Fighter Command put seventeen squadrons into the air to fight off a major Luftwaffe attack. As a forward air base with re-fuelling facilities, Hawkinge played a major part in the success of this day for Fighter Command. While Spitfires and Hurricanes were kept in the air, the bombers of the Luftwaffe could not concentrate on their main task – attacking London. On November 15th No 421 Flight arrived at Hawkinge. This was in direct response to the hit-and-run attacks that the base was suffering. Me-109s came in under radar and bombed the base before immediately returning to their base in northern France. This gave Hawkinge no time to get its fighters into the air. No 421 had six Spitfire IIAs and its task was to have some of these Spitfires in the air patrolling the Channel at all times during daylight. A quick radio call back to base would warn of any enemy aeroplane seen coming into attack regardless of whether they were coming in under radar cover. It was No 421 that earned Hawkinge its first DFC – award to Flight Lieutenant B Drake. In January 1941, No 421 Flight was renamed No 91 (Nigeria) Squadron. The government of Nigeria paid for and presented No 91 with fifteen Spitfires – hence the Nigeria in the Squadron's title. Because of its proximity to the sea, Hawkinge also became a base for Air Sea Rescue. Lysanders and converted Defiants carried out this task (eventually along with Walruses and Sea Otters). It was not unusual for these planes to be escorted by Spitfires while they were searching for crash victims, as they were slow and obvious targets for roaming Me-109s or FW 190s. When the war was taken to Nazi Germany, fighters based at Hawkinge acted as escorts to Bomber Command and to the USAAF. The base also acted as an emergency landing strip for damaged bombers returning from a raid – though the runways had to be extended to accommodate this. Hawkinge played a major part on June 6th 1944 – D-Day. In fact, in the lead up to the invasion of Normandy, Hawkinge had two roles. The first was to create an effect that would convince the Germans that the invasion would be in the Calais areas. Hence a great deal of air traffic was seen around Hawkinge. For the actual invasion, fighters from Hawkinge kept the air routes open and ensured that there was no U-boat activity in the Channel. For this reason depth charge equipped Grumman Avengers used Hawkinge. Spitfires from Hawkinge were also used against V1s as they approached the Kent coast. The success of the Allied advance through Western Europe meant that more and more fighter bases moved to mainland Europe. As a result, Hawkinge became less used. Its last purpose was as a base to document German prisoners-of-war. On 3 September 1945, the RAF officially closed the fighter base though it did have several short-term tasks after the war – as a WAAF training school and a gliding school. Literally on the front line, Hawkinge played a major part in the success of Fighter Command during the Battle of Britain. A testament to its importance was the frequency with which the Luftwaffe bombed the base.